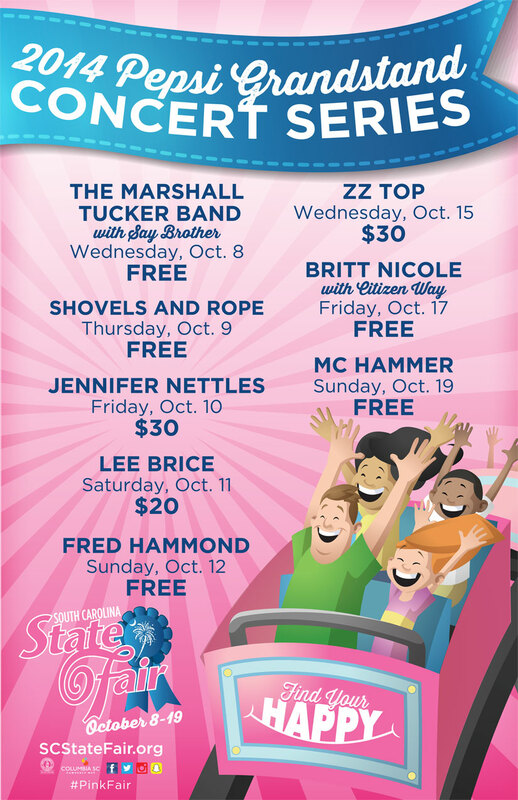 When you think of the South Carolina State Fair you don’t typically think good music, but that’s changed over the past couple of years with bands like The Avett Brothers performing and this year’s lineup anchored by SC natives Shovels and Rope, Lee Brice, and The Marshall Tucker Band. Throw in MC Hammer and ZZ Top and you’ve got an incredibly entertaining lineup, and to top it off five of the eight shows are free with admission to the fair. Spartanburg natives The Marshall Tucker Band play for free the fair’s opening night, which includes $1 admission, while Charleston band Shovels and Rope play college night, which is free to the first 5,000 people and free to everyone with a valid college ID. In addition to the grandstand lineup, we’ll be back October 16, 18, and 19 in the WIS tent presenting nine bands from all over South Carolina on the SceneSC stage. You’ll notice that Say Brother made such a great impression on our stage last year that they’ve moved to the main stage this year opening for The Marshall Tucker Band. And there seems to be an announcement on the horizon of another local band opening for Shovels and Rope, but we’ll have to wait and see. I really thought Say Brother would never be invited back to the State Fair after there was almost a riot when they played so loud that they delayed the 9 PM Swifty Swine pig race. On the hour every hour, except when Say Brother is raising hell in the tent next door. We’ll have our local band announcement in the coming weeks and we promise it’s something to look forward to for local music lovers. Support SceneSC by clicking the “like” button below.